Roger Earl, the original founding drummer of the rock band Foghat, has secured a temporary injunction preventing Artists International Management, Inc. and Tony Stevens from continuing to infringe upon his rights in using the Foghat name. 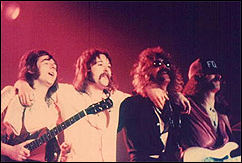 The injunction prohibits Stevens from using the name Foghat to identify a band or musical performances. Attorneys Mark E. Stein and Leslie Lott of Lott & Friedland, P.A., a Florida-based law firm specializing in intellectual property law. represents Earl and his corporation, Noisy S.O.D. Inc. "We are very pleased that the court recognized our clients' ownership rights in the Foghat name," said Stein. "The Court found that the public was confused and that the harm to our client, which has already been significant, would continue and grow if not for the entry of the injunction," added Lott. Earl is the only member of the band who, except for one brief period, has played as Foghat since the band's founding in 1971. Stevens was an original member, but he left the band and all of his interest was bought out in 1974. He was invited to return to the band in 1993 but left again in December 2004. In 2005, Stevens began touring with other musicians under the name Foghat, causing confusion with the original Foghat, which is and has been actively touring the country.